This past weekend marked our first oyster adventure. 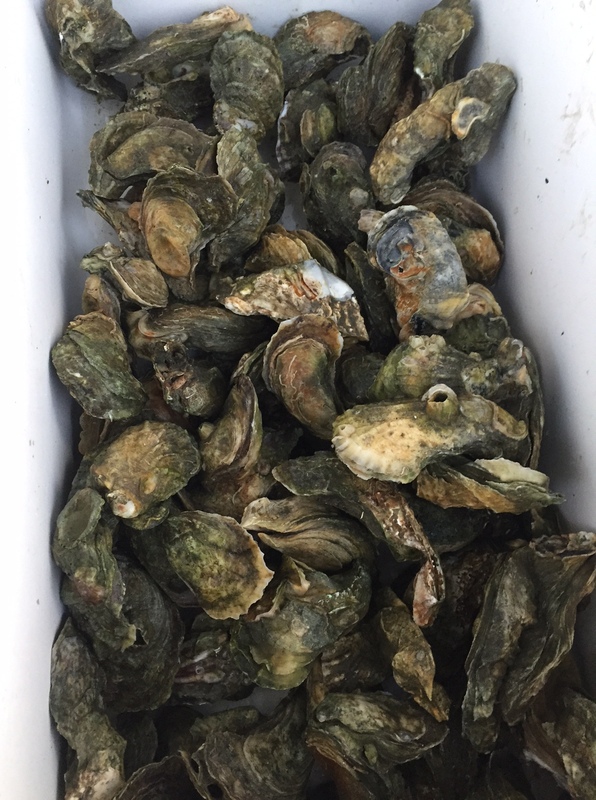 We took out a boat from the hubby’s new job and went to hunt for oysters. I had never done this before and was extremely skeptical about our ability to find enough oysters for dinner. This proves two things. 1. That my opinion was formed on Tyler’s many previous broken promises of bringing home fish for dinner and 2. That I have never done this before. We came home with enough oysters to share with his coworkers and have two very indulgent oyster suppers. And so I learned to shuck oysters! And make a lot of jokes with shuck instead of… a word I’ve never said or heard before. 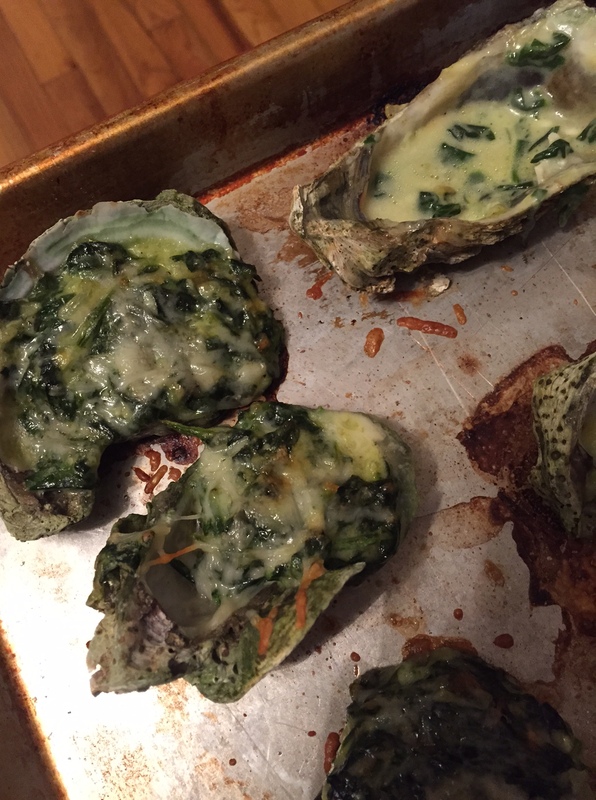 The second night of indulgent oyster suppers, we decided to Oysters Rockefeller. The Internet has an endless number of recipes but they range widely in ingredients and directions. So, sometimes you just have to make it up yourself! Preheat your oven to 450F. Line a large jelly roll pan or cookie sheet with foil or anything that will make cleaning up this serious mess easier. Melt the butter in a saucepan on medium low heat (like a 3 if yours has numbers on it) and throw in your onion and garlic. Cook until translucent. Add your spinach a handful or so at a time letting it cook down slowly. Add the hot sauce. After your spinach is looking all nice and hot but not too sad and wimpy start adding in cream. Add only a tablespoon or so at a time and stir constantly. It should end up being about half a cup but I must admit, I didn’t measure it out. Continue stirring and throw in your flour. Your spinach should be looking creamy and thick now. Stir in about half a cup to a cup of mozzarella cheese. It depends how decadent you want this to be. It should look like spinach dip basically. Season with salt & pepper. Spoon about a tablespoon onto each oyster, adding more if needed until the oyster is hidden beneath all the green goodness. Top with a sprinkle of parmesan cheese (the good kind- no shaker stuff here). Cook for 15-17 minutes until bubbly and a little bit golden brown. Or until your drooling in front of the oven becomes too much to bear. Hopefully yours will be prettier than these but either way they are so shuckin’ good.